The spotted leaf-nosed snake is found throughout the Colorado and Mojave deserts and parts of the Sonoran Desert in a wide variety of habitats. Its elevational range extends to 900 m (3000 ft) (Stebbins 1985). It occurs in rocky and sandy flats and slopes but seldom in areas of uniformly sandy soil. It is most abundant in areas of mixed sandy soil and rocky or firm soil with some brush cover. In the southern parts of its range, this species can be active any time of year that temperatures are mild to warm, but the peak of activity is from April to July. This is a secretive and poorly known snake (Klauber 1940, Brattstrom 1953, Stebbins 1954). Feeding: This snake preys extensively on small lizards (and their eggs), especially Coleonyx variegatus. Often it is only able to get the tails of Coleonyx and the eggs (Stebbins 1954). 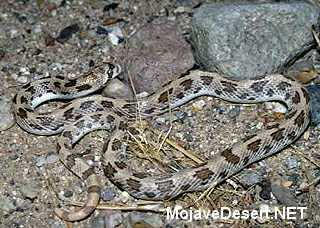 Cover: Sometimes these snakes use surface cover, but they usually burrow in loose soil or sand. They do not burrow as well as Chionactis or Chilomeniscus (Brattstrom 1953, Stebbins 1954). Reproduction: Presumably, this species lays eggs in rodent burrows or loose soil (Stebbins 1954). Water: Free water is probably not required as this snake occurs in arid areas quite distant from water. Pattern: The spotted leaf-nosed snake is a sand-burrowing lizard specialist that preys mostly on Coleonyx. It prefers, as does Coleonyx, areas of mixed sandy and rocky or firm soil with some brush cover. Activity Patterns: This snake is nocturnal. It is active in the early evening during mild to warm weather. Greatest activity occurs from April to July (Stebbins 1954). May aestivate and likely hibernates. Reproduction: This snake lays 2-4 large eggs in June and July (Stebbins 1954). Niche: Predators probably include owls, roadrunners, other avian predators, mammalian predators, and kingsnakes.